THE MAYBELLINE STORY : Frances - the Bride who helped launch an Empire! Frances - the Bride who helped launch an Empire! Frances... the Bride, who postponed her Wedding for a year, so her fiance's brother, might have a chance at starting a little company, called Maybelline. 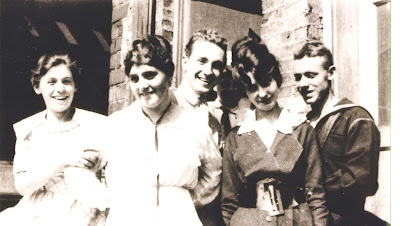 Eva, Frances, (the Bride,) Tom Lyle, Noel James, (the Groom, in the shadows,) Bennie and my grandfather, Preston - Chicago, 1917, soon after Maybelline was launched. Line loaf pan with cookies. Add layer of chocolate mixture. Continue layering cookies and chocolate mixture, ending with chocolate. Store in refrigerator and slice and serve with whipped cream. Today I made an, out of this world, deep dark chocolate, delightful dessert and my audience couldn't get enough. I hope you make this recipe, as it will surely become a special-occasion, family favorite. OH! By the way, if you want to know about the Bride, who waited a year, for the sake of Maybelline, read The Maybelline Story soon. Check in next week, and watch Sharrie make her auntie Frances', Chocolate Icebox Dessert on The Morning Scramble - AZTV.